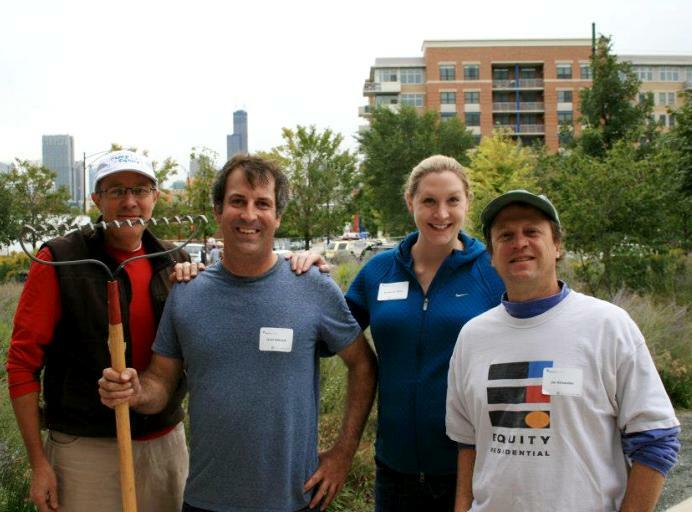 Equity Residential employees take a break from landscaping the prairie garden at the Schiff Residences. More than a dozen employees from Equity Residential teamed up earlier this fall to complete the final stage of landscaping and construction for a new patio space at the Margot and Harold Schiff Residences on Chicago’s near north side. During the day, the group planted trees and flowering bushes, weeded the prairie garden, spread mulch and gravel, and repainted a fence. It was hard, difficult work, but the volunteers participated enthusiastically. Several residents also helped complete the project. Tenant Leaders from the building held fundraisers throughout the summer to help raise money for the completion of the patio project, which was identified by the residents as an area that they would like to see improved. In addition, several residents volunteered alongside the Equity Residential employees to complete the project. The Margot and Harold Schiff Residences provides 96 units of permanent supportive housing for people who have been chronically homeless or at risk for homelessness. The building is named for Margot and Harold Schiff who contributed $1 million to support Mercy Housing Lakefront’s efforts to end homelessness. Prior to his passing earlier this fall, Harold Schiff, also donated $5,000 to help complete the patio project. Special thanks to Equity Residential for assisting Mercy Housing in building stable, vibrant and healthy communities. If you are interested in having a group from your company participate in a volunteer program with Mercy Housing, please contact Janet Dahlstrom at jdahlstrom@mercyhousing.org.